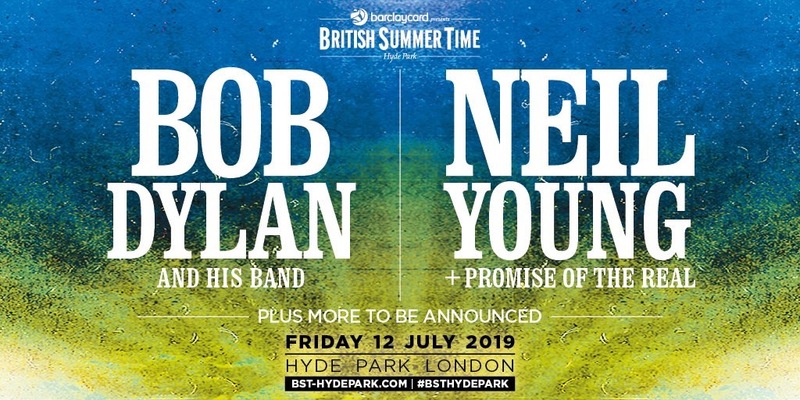 Barclaycard presents British Summer Time Hyde Park announces its first headliners for 2019 – two of the greatest musicians of all time on one HISTORIC night. Bob Dylan and Neil Young are joint headliners. Bob Dylan’s impact on popular music and culture is immeasurable. The recipient of the Presidential Medal of Freedom and the 2016 Nobel Prize in Literature, he is responsible for some of the most influential albums of all time, such as ‘The Freewheelin’Bob Dylan’, ‘Highway 61 Revisited’, and ‘Blonde on Blonde’. He continues to be vibrant and on the cutting edge, Bob Dylan has received 10 GRAMMY Awards (including wins for Love And Theft, Modern Times and the Album of the Year GRAMMY for Time Out of Mind), as well as the Academy Award for Best Original Song for ‘Things Have Changed’ in 2002. Neil Young remains the only artist of the rock era to compare to Dylan. Classic albums like ‘Harvest’, ‘After The Goldrush’ and ‘On The Beach’ are some the best in the whole genre. But Young remains hugely relevant and prolific, releasing 2 albums within months of each other in 2017/2018, as well as a stream of archive albums from classic live shows over the years, underlining his incredible live legacy. This time, he brings Promise of the Real, with whom he recorded 2017’s album ‘The Visitor’, their second studio album together and this year released the soundtrack album ‘Paradox’. The band features Willie Nelson’s sons Lukas and Micah. They also star in Bradley Cooper and Lady Gaga acclaimed new movie ‘A Star Is Born’, with Lukas as musical consultant. Last year continued the tradition of must-see experiences that has seen The Rolling Stones return to Hyde Park, Carole King play her classic album ‘Tapestry’ in full for the first time ever, comebacks for The Strokes and The Libertines, Stevie Wonder play Songs in The Key Of Life and many more. 2018 saw amazing sold out shows with Roger Waters, Bruno Mars, Michael Bublé, The Cure, Eric Clapton and Paul Simon’s last ever UK concert. Set in London’s beautiful Royal Park, the event kicked off in 2013 with The Rolling Stones reliving their legendary 1969 gig, plus Bon Jovi, Lionel Richie, Jennifer Lopez and many more packing out the park for memorable summer nights. In 2018, the festival experienced more classic moments, kicking off with an incredible multi-media experience with Roger Waters, followed by a hit filled 40thanniversary from the Cure, Eric Clapton, the UK return of Michael Bublé,a pop master class from Bruno Mars and Paul Simon’s last ever UK gig. The event has featured many now famous shows from Carole King, Stevie Wonder, The Libertines, Blur, Florence + The Machine, Kendrick Lamar, Black Sabbath, Taylor Swift, The Who and so many more. Every year, each headliner is joined by a full supporting line-up across multiple stages, from major superstars to handpicked developing acts performing for fans from across the UK and the world. AEG Presents is AEG’s live-entertainment division, a collection of companies dedicated to all aspects of live contemporary music performance, touring and a variety of programming and multi-media production. AEG Presents is behind festivals such as California’s famed Coachella, Los Angeles’ Camp Flog Gnaw Carnival, London’s British Summer Time Hyde Park and All Points East, Paris’ Rock en Seine and a myriad of tours, live shows and venues around the world including the world’s most popular venue The O2 in London, LA’s Staples Center and many more. The Royal Parks is a charity created in March 2017 to manage 5,000 acres of historic Royal parkland across London.The Royal Parks are: Hyde Park, The Green Park, Richmond Park, Greenwich Park, St James’s Park, Bushy Park, The Regent’s Park and Primrose Hill, and Kensington Gardens. We also manage other important open spaces in the capital including Brompton Cemetery, Victoria Tower Gardens, Canning Green and Poet’s Corner, and we maintain the gardens of 10, 11 and 12 Downing Street. It costs around £36m a year to manage the parks. We raise around 75 per cent of this money ourselves, with the remaining 25 per cent coming from Government. Every year millions of visitors from London, the UK and across the globe enjoy the iconic Hyde Park, one of the capital’s eight Royal Parks. Spanning 350 acres of green space in central London, Hyde Park has hosted world renowned music artists since the 1960s. The summer concerts are an essential part of income generation for The Royal Parks, providing necessary funds to maintain and develop the parks for future generations to enjoy. They also help support the diverse culture of London, and introduce new audiences to the parks. For further information please visit: http://www.royalparks.org.uk. THE WANDERING HEARTS ANNOUNCE ‘WILD SILENCE DELUXE’ ALBUM INCLUDING THREE NEW TRACKS NEW SINGLE ‘TIL THE DAY I DIE’ OUT NOW!